Rock is quarried and mined for many purposes – as building and ornamental stone; for metal ores; limestone is used for agricultural lime and cement; sand, gravel and crushed rock are needed as aggregate in road building and construction. Working quarries are busy places with many hazards and they are often regarded by the public as visual scars on the scenery. Yet rock can be very beautiful and quarrying exposes it in a fresh, pristine condition. Furthermore, there are few other places, apart from mountain and coastal cliffs, where we can see and understand, on such a large scale, the nature and structure of the rocks that govern our landscapes. Quarries thus offer us a unique opportunity to learn. A visit to an active quarry can be a fascinating experience, but when extraction ceases many sites can be developed and gain a new lease of life, providing recreational and educational facilities for the nearby community. 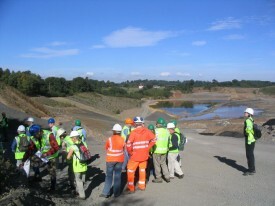 Where this is possible, quarry companies may work closely with local people and interested environmental organisations to plan and effect the change. 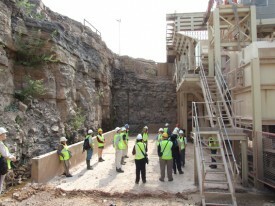 Visit to an active quarry crushing plant. The prevalence of road building and other construction work in modern society has meant that there is one quarry product for which there is a voracious demand: aggregates. Hundreds of millions of tonnes of sand, gravel and crushed rock are needed in the UK every year. 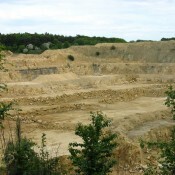 A large proportion of our quarries therefore extract aggregate, and in 2002 a tax was introduced to raise money from the industry to compensate for the environmental effects of large scale quarrying, such as noise, dust, visual intrusion and damage to biodiversity. Visit to a recently closed quarry being landscaped with a geology trail. 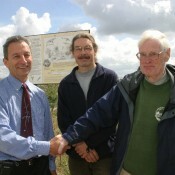 Gilbert Green from Wiltshire Geology Group with quarry managers unveiling an information board at a Wiltshire quarry. 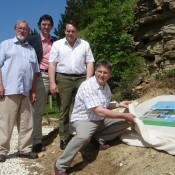 Mark Campbell from Gloucestershire Geology Trust with the managers of Huntsmans Quarry, Gloucestershire. This money has been used to fund a range of projects that benefit communities near quarry sites, from wildlife surveys to education events and conservation work. 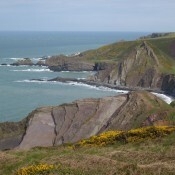 Until 2011, it was distributed by the Aggregates Levy Sustainability Fund (ALSF), which was administered by agencies such as Natural England and English Heritage. ALSF was recently discontinued – a victim of government austerity cuts. Much of the work carried out by The Geology Trusts and its member organisations has been funded by ALSF. We are grateful for that financial input and the advice and support we have received from the ALSF team at Natural England. These projects have led us to develop good working relationships with quarry operators, working with them in partnership to bring an appreciation of our fabulous rocks to the public. 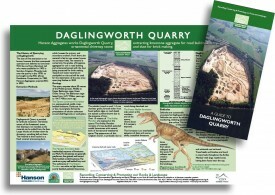 Daglingworth Quarry commissioned Gloucestershire Geology Trust to design this leaflet and display board.